In December 2017, Lyon’s Hôtel-Dieu will open its doors to the public once again after a major phase of redevelopment. 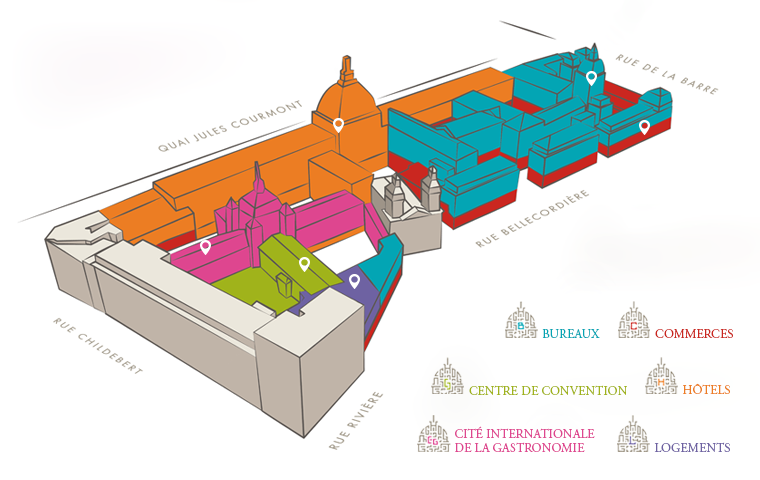 The work to renovate and transform Hôtel-Dieu began on 3 April 2015. The Grand Hôtel-Dieu was listed as a “Historical Monument” in 2011, rendering the restoration work more challenging and painstaking. Eiffage Immobilier was tasked with managing the Hôtel-Dieu redevelopment project. Blending innovation and heritage transmission, this ambitious project will combine workspaces, the Cité Internationale de la Gastronomie, a hotel, shops, housing units and a shaded garden. In all, there will be 42,000 sq. m. of restored buildings, 10,000 sq. m. of new buildings and 8,000 sq. m. of gardens. An estimated 7 million visitors will come to enjoy this new space in the heart of Lyon. The InterContinental Group will manage the 5-star hotel slated to open in December 2018. This 13,237 sq. m. facility will have over 143 rooms, including 24 junior suites and a Presidential Suite, 2 meeting rooms, a lounge, restaurants and a 100 sq. m. gym. The 17,635 sq. m. shopping area invites visitors to stroll along the gardens that line the stores. Several courtyards will separate these shopping areas, grouped by product type, e.g. fashion, decoration, beauty and food. Hôtel-Dieu, an integral part of Lyon’s heritage, is destined to write a new page of the city’s history, with innovation and transmission at the heart of the project. Yet another success for the Lyon metropolitan area. More information about development projects in Lyon, contact us !